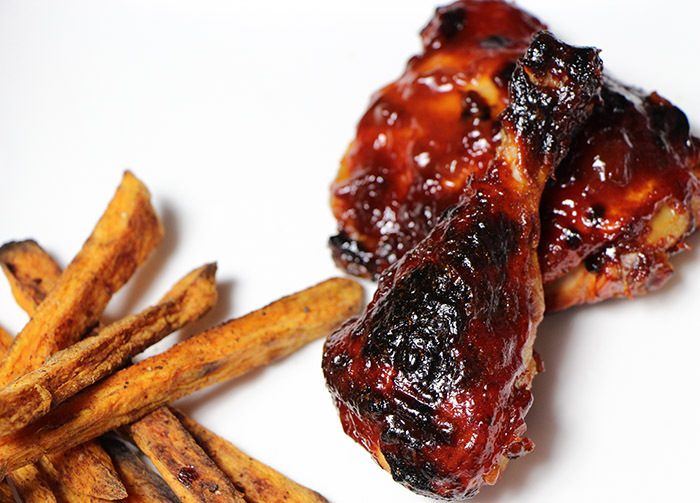 This chicken with bourbon barbeque sauce recipe pairs very well with the sweet potato fries, smashed fried potatoes, and the sweet corn pudding. Always a hit at any barbecue we have! Preheat oven to 425 degrees. Move rack to second highest position; or, if using a gas grill, light the left and right burners and set to medium, leaving the middle burner off. Apply a very thin coating of the BBQ sauce to all of the chicken. Place chicken on a foil-lined rack or on the center grates of the grill if grilling. Roast the chicken for 10-15 minutes and apply a thin layer of barbecue sauce to the skin side, making sure to cover thoroughly with the sauce. Repeat this process every 15 minutes or so with very thin layers of sauce until chicken is slightly charred in spots and the sauce is a deep reddish color and the chicken is cooked through to a temperature of 165-170 degrees, about 45 minutes, total. I like to bring the thigh temp up a few more degrees than usual, as this really helps ensure the meat is tender and juicy and the meat by the bone is thoroughly cooked. Don’t worry about overcooking the thigh or drumsticks, it’s nearly impossible to do.